"What does it do?" is a question a friend of mine often asks me when she goes with me to a garden center. I imagine she's thinking something along the lines of green plant, plant with flowers I recognize, green plant with pretty pink flowers, plant with yellow flowers, red-leaf plant, green plant, green plant, tree with leaves, etc. Then she'll point to one and ask, "What does it do?" 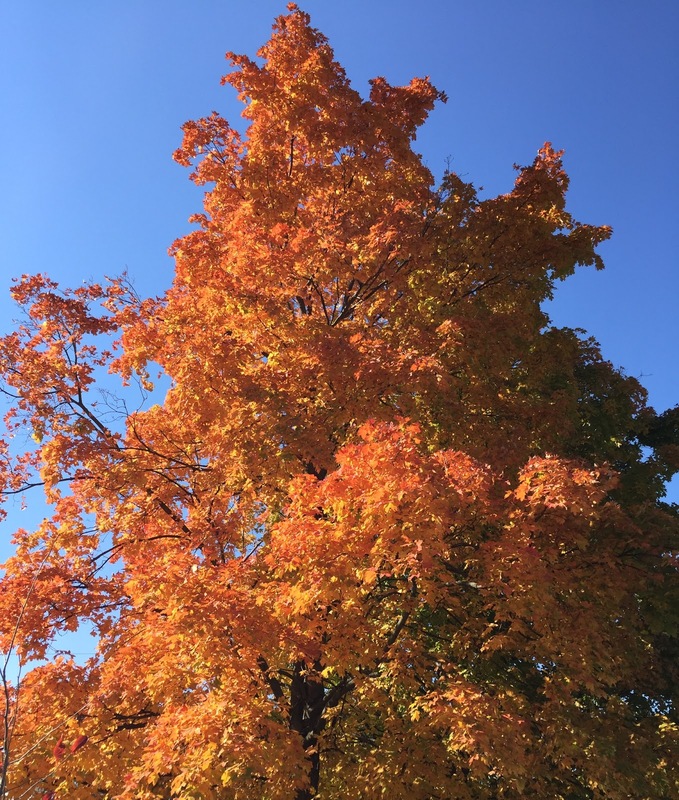 If it is a tree, it provides shade in the summertime and then when its leaves turn a brilliant orange in the fall, they make you smile and so happy to see them against a clear blue sky. And when the leaves fall, the tree provides you with a bit of fun and memories of being a kid as you shuffle through them and enjoy the sound they make as they crackle under your feet. Then you rake the leaves into a big pile and sit amongst them, even if it is on a lawn chair and not the bare ground, smelling their woodsy goodness and remembering what it was like to be a kid in a pile of leaves on a brisk, bright autumn day. The tree helps you exercise as you rake all those leaves up. And those leaves, freely given by the tree, add to your compost pile and become food for all kinds of micro-organisms that break the leaves down into compost, which becomes food for the plants in the garden. It provides shelter for birds, insects, even squirrels. It is their home, their playground, sometimes their source of food. And that's the short answer. A tree, even a shrub, does a lot. Remember that the next time you go to a garden center and are walking amongst the trees and shrubs. Remember how much each one does, how much just one tree adds to our health and well-being, to our very lives. I loved this post"What Does It Do?" I also have friends who do not even notice the subtle magic my lovely plants perform. I guess some need to be grabbed or sprayed by a plant to acknowledge it.